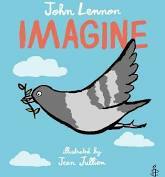 Today is International Day of Peace and today the lyrics of John Lennon's famous song Imagine, about peace and tolerance, are due for publication in a picture book illustrated by Jean Jullien. The book is published by Clarion Publishers in conjunction with Amnesty International and follows the travels of a pigeon spreading a message of friendship and hope to other birds. The above information is adapted from Publishers Weekly HERE. You can find out more about the book and Amnesty International HERE.